Once they have voted, the ballots are burned in one stove and flares are burned in an electronic stove to produce the correct color. The flues of the two stoves converge into one that emerges from the roof of the Sistine Chapel. White smoke means a pope has been elected and black smoke means the vote is inconclusive. 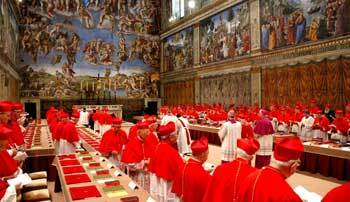 From Wednesday, the cardinals will vote as many as four times a day, twice in the morning and twice in the afternoon, until they have elected a new leader of the Roman Catholic Church. If no one has been elected by Friday, the cardinals will hold a day of prayer and reflection on Saturday before resuming the voting. This entry was posted in Conclave 2013 and tagged 2013 Conclave, ballots, black smoke, Giovanni Battista Re, new leader, new pope, Roman Catholic Church, Roman Pontiff, Sistine Chapel, Smoke, stove, The 2013 Conclave, white smoke by Secretary. Bookmark the permalink. God Bless all the cardinals. May the Holy Spirit be the guide as these men open their hearts to Gods will. May the church join in prayer that Gods will be heard and done.